The #WinterOlympics have swept the nation and many have turned their attention to Pyeongchang. But the deluge of coverage isn’t just on your TV. Post after post about the Olympics are likely filling up your feeds, from Facebook and Twitter to Instagram and Snapchat. With such stiff competition, one account has climbed its way to the top in the arena that is social media. Those behind @NBCOlympics have obviously done their homework. Just by looking through the various platforms, you can see a lot of preparation was done. 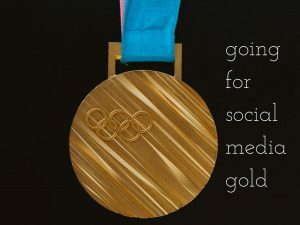 One post we believe represents this best is the “100 gold medals” video that was posted immediately after Shaun White took home Team USA’s 100th gold medal in the Winter Olympics. With the amount of research and the emotional pull, it’s obvious this video wasn’t put together in five minutes. On social media, the conversation moves faster than you can refresh your page. In order to get people to engage with your content, you need to plug yourself into the ever-changing discussion. @NBCOlympics is doing a great job keeping up-to-date with what’s trending. When Twitter exploded over snowboarder Chloe Kim tweeting about ice cream and churros, @NBCOlympics seized the opportunity in the form of a hilarious video featuring a churro in the place of the gold medalist’s snowboard. What catches people’s attention on the internet and makes them laugh? Meme-worthy photos and hilarious captions. People love laughing at memes and most importantly, sharing them with their followers. @NBCOlympics has been creating some excellent content, balancing the professional and newsworthy with the more light-hearted. Just like it’s important to stay up-to-date with what’s trending, brand managers need to keep in mind what’s going on in the world. Valentine’s Day happens every year on February 14, and this year, it fell during the Olympics. @NBCOlympics did a great job using this holiday to write creative and funny posts like these Valentine’s Day cards. When you’re creating social media content, one of the main goals is to drum up engagement. @NBCOlympics is doing an incredible job creating content that gets people involved with the Winter Olympics. One way those behind the account are achieving this is through #EverydayOlympics. These are videos of ordinary people “competing” in Olympic events in their everyday lives, which both encourages people to create their own content and share with the brand and encourages others to comment and share. If you’re looking for ways to spice up your social media accounts, get some inspiration from the account that deserves the gold, @NBCOlympics. And if you want some help in reaching gold status yourself, give us a call at 407-390-9999 or email Will at will@wellonscommunications.com. We’re already feeling inspired and can’t wait to help you become a social media champion.